Que: The “Cotton Belt” of Punjab is located in which Physiographic region of Punjab? Que: Where is the Sikh Heritage Complex Developed? Que: Who is the first lady Chief Minister of Punjab? Que: According to the 2011 census, what is the literacy rate in Punjab? Que: Who was the first Governor of Punjab? Que: Who is the first lady Deputy commissioner of Punjab? Que: When was Punjabi University established at Patiala ? Que: Who is the first Punjabi novelist to get Jananpith Award? 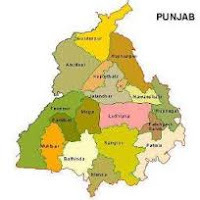 Que: Which district of Punjab is most populous?